Live C. diff cells captured under the microscope. When giving a presentation on his new method for imaging live Clostridium difficile (C. diff), David Courson always puts the bacterium’s societal effects into perspective. Each year in the United States, C. diff infection contributes to an estimated 29,000 deaths, costing the economy $4.8 billion. Unfortunately, big numbers like these get thrown around every day. So, Courson goes a step further: These numbers roughly equal the student population and endowment of UNC-Chapel Hill, respectively. That gets people’s attention. C. diff is one of the most dangerous drug-resistant infections. As a result, it’s classified as an “urgent threat” by the Centers for Disease Control and Prevention, making it a top priority for microbial researchers. However, it’s notoriously difficult to study in the lab (difficile was so named in the 1930s because researchers found it difficult to isolate). Courson, a postdoctoral researcher in the Department of Cell Biology and Physiology at UNC, aims to change all of that. A gut microbe with a nasty habit of causing infection in patients that are already sick, C. diff presents an uncommon challenge for modern clinicians and scientists. Typically found in the hospital, it’s antibiotic-resistant and presents a serious and growing threat to patients. In hospital rooms, C. diff spores spread infection by protecting the bacteria from disinfectants and stomach acids. The infection then takes hold in the intestine after antibiotic treatment or when the patient’s immune system is weakened, causing severe diarrhea that can lead to death. The emerging threat of C. diff presents a grand challenge, one where success means tens of thousands of lives saved. Such a cause is a frequent motivator for medical research. However, in this case, the idea for Courson’s research came from more common circumstances: a conversation over dinner with his wife, Erin Purcell, who studies C. diff in Rita Tamayo’s lab at UNC. Sitting down to dinner one evening, Courson began asking his wife questions about her research. “I asked her all kinds of questions: how C. diff interacts with the gut, how it moves around. The answers were always ‘We don’t know.’” This conversation got Courson thinking. He wanted to know the answers to these questions, but there is a reason that so little is known about the bacterium. In fact, C. diff presents microbial researchers with a set of characteristics seemingly designed to circumvent standard lab techniques. Artificial mutations in the bacterium, common for years in other laboratory strains of bacteria, were only achieved in C. diff a couple of years ago. The difficulty of genetic modification drastically reduces researchers’ ability to test gene function, hindering progress toward therapeutics. Compounding the issue of genetics is the fact that C. diff is an “obligate anaerobe,” which is scientific lingo for “organism poisoned by oxygen.” This means that C. diff requires special, oxygen-free environments to grow in the lab. Simple experiments such as looking at live cells under a microscope are prohibitive because of the specialized equipment required. So even basic information is lacking. For example, how does C. diff move? A childhood spent birdwatching and building electronics made Courson into a patient tinkerer. Using parts from around the lab, he pieced together a system of airtight chambers for visualizing live C. diff. This system allowed him to observe the movements and other behaviors of the bacterium for up to four days. He found that it swims using flagella, a whip-like attachment on the rear of the bacterium. Not satisfied with observing only the bacteria, Courson decided to observe the interaction between the bacteria and the cells that line the gut, called epithelial cells. The particular line of epithelial cells that Courson used is resistant to low-oxygen conditions, living for at least two days in his airtight, oxygen-free chambers. However, when bacteria were added to the mix, the epithelial cells only lived for 12 to 16 hours. The increased cell death indicated that presence of C. diff hurt the cells. It also told Courson that his system worked, allowing him to ask detailed questions about what happens to epithelial cells when exposed to C. diff. Epithelial cells normally look a bit like a honeycomb, compact and orderly. But just a few hours after Courson adds bacteria, the cells undergo a drastic change in shape. They convulse and pull away from each other, indications that the cells are dying. These data provide answers to basic questions about how C. diff infections work. In future studies, Courson plans to ask more detailed questions about C. diff infections. For instance, how does it find its site of infection in the intestine? Also, how does it survive antibiotic treatment? Fortunately, he continues to collaborate with Purcell, who was among the first to make genetic modifications to C. diff. 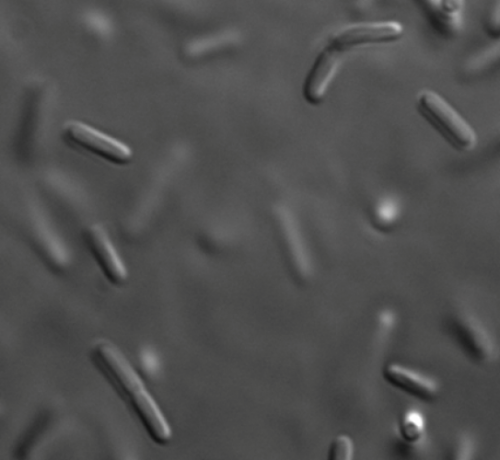 By combining live imaging with ever-finer genetic analysis, Courson hopes to understand the bacterium’s biology and, in doing so, find a workable treatment for the infection. Studying bacteria in the context of human health is relatively new for Courson. He began his career as a biophysicist, including a stint researching DNA origami (where DNA is folded into specific shapes and held together with molecular “staples”). However, he is intellectually adaptable and hungers for discovery. These characteristics are what drove him to shape his research around what started as a simple dinner conversation. David Courson is a postdoctoral fellow in UNC-Chapel Hill’s Department of Cell Biology and Physiology, and is a member of the Richard Cheney Lab.